German National Association for Student Affairs (Deutsches Studentenwerk or DSW) sent their delegation which comprises of its President, Secretary General and some representatives from the regional studentenwerke (student services organisations). 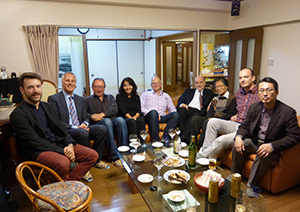 In total there were eight DSW staff who participated in visit to Japan in 21-25 October 2013. This training was conducted under various themes, including further developing the student support in higher education institutions, sharing the situation and challenges of students in terms of mental and spiritual aspects, and sharing the situation and challenges of international students. 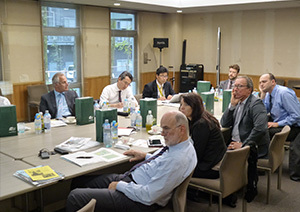 The delegation visited Tokyo (the University of Tokyo and Tokyo Institute of Technology), Nagoya (Nagoya University) and Kyoto (Doshisha Co-op). In Tokyo Institute of Technology there was a presentation of “The Philosophy and Practice of Student Counseling in Japan” from the lecturer of Health Service Center (a counselor) based on the student counseling practice in Tokyo Institute of Technology. DSW also presented their social and psychological counseling experience. In Nagoya University there was a presentation about the situation and challenges of students from an assistant professor from the Center for Student Counseling whose expertise is in mental health. The presentation mainly explored the study case of social withdrawal (hikikomori) of graduate students and the efforts done by the university. In Doshisha University, there were presentations from JASSO (Japan Student Services Organization) and Organization for the Promotion of Global Cooperation about the situation of international students, partner universities abroad, and support for international students. Since the exchange between DSW and NFUCA has been going for years, this year both parties agreed to focus to a specific theme. We had a meaningful exchange of views on student counseling. At first the exchange with DSW was carried out at the national level, but it has been gradually shifted to co-op members and regional studentenwerke. We planned to visit Germany in 2014.